Have you ever read Jack Ketchum's OFF SEASON? If you did and you enjoyed it I recommend you give CHASING GHOSTS a go! This novella flies by with the usual type of horror happenings. A gathering at a cabin with a bunch of hipsters ends up turning out to be something of a snack bar for your local hillbilly cannibals. With people disappearing, (mostly) one by one, and then the same happening to those who go out to look for them, this is not exactly original fare for horror lovers. What I think made this novella more fun than most, was its fast pace, the new and unique ways of captivity and death, and the likable, (mostly), characters. 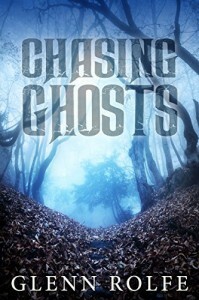 CHASING GHOSTS is not perfect, there were just a few punctuation and grammar errors, but not enough to bother me. I've read a few stories from Mr. Rolfe now, and it's my position that he keeps getting better and better. Enthusiastically recommended, especially for those horror fans that love the work of Jack Ketchum, or love the whole redneck cannibal trope. This one's for you!